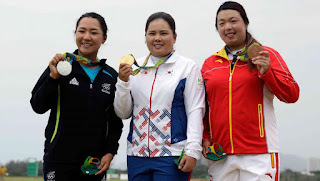 Mommy and Tee: CONGRATS, Inbee Park, on Olympic Gold! CONGRATS, Inbee Park, on Olympic Gold! Queen Bee, I almost forgot about you before this Olympics. Shame on me! Park in my opinion is a player with a game that isn't flashy, which always makes it fun to watch her win against other players whose game may have style, but are rocky in substance in comparison. Good for her for coming through this week to win all week long. I genuinely enjoyed keeping up with the scores of women's golf's return to the Olympics, even if I thought the broadcast to be painstakingly dull (in comparison to usual televised golf). After predicting Lydia Ko would medal, I'm glad to see she battled back to Silver after a rocky start. I kind of figured she would dominate all four days, but it was truly more exciting to see her dig in like she did and play so well under pressure. On team USA, I was happy to see Stacy Lewis post some awesome scores as well and I was really rooting for her. I was sad for her that a medal didn't happen even after she came so close, missing a birdie on the 18th that would have forced a playoff for bronze. It was SO. CLOSE. Gerina Piller had a great week too, especially day two when she tied for second and it must have been tough to not medal being paired with the lead group. Fingers crossed that the IOC keeps golf in at least through 2020. I'd like to see several things changed (not that they're asking me, but still), such as team golf. As for me, the league championship is coming up but it's looking like I won't be able to get in two of the three necessary rounds in order to have my scores count. I'm sad, but it is what it is. I still have a week or two to try to solidify a baby sitter so I can at least play in one of them. The good news is that it seems like the summer heat is (relatively) breaking and the cooler weather of fall is (somewhat) flirting with us. So that should make it better to play with this growing bump of mine!